President Trump took to Twitter Wednesday morning to slam Democrats and their supporters for faux outrage over FBI head James Comey’s firing, when for months on end they have been calling for him to be removed from office. “Now they play so sad!” Trump tweeted, noting that it has been Democrats who displayed the most outrage at Comey over his role in the Hillary Clinton Email scandal. After calling for Comey to be removed for reopening the investigation into Clinton’s homebrew email server just days prior to the election, and for generally not doing a very good job as FBI head, many on the left are now suggesting that Comey’s firing is some sort of cover up by the Trump White House, in order to put the brakes on the investigation into alleged links between Trump’s election campaign and the Russian government. In reality, Democrats were for the firing of Comey before they were against it. Earlier this year, Democrats were up in arms following a closed-door briefing with Comey describing the FBI head as “contentious” and “combative.” Many were said to have walked out of the meeting. “My confidence in the FBI director’s ability to lead this agency has been shaken,” said Rep. Hank Johnson (D-Ga.). Yet now Pelosi is calling for “an independent, bipartisan commission” following Comey’s firing. Right. So now Hillary lost, Comey’s previously justifiable dismissal is some sort of complex conspiracy. 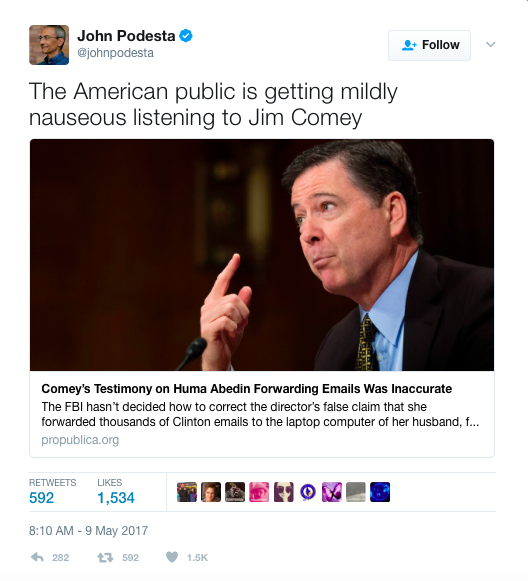 Ok.
Hillary aide John Podesta described Comey as ‘nauseating’ during the investigation into Clinton, yet now the FBI head has been fired by Trump, Podesta also seems to think it’s a nefarious plot. 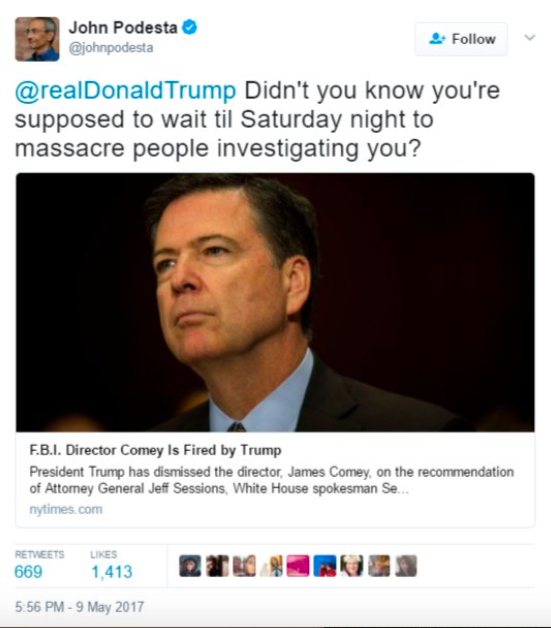 Podesta was citing the so called ‘Saturday Night Massacre’, when then-President Richard Nixon fired special prosecutor Archibald Cox, and accepted the resignations of Attorney General Elliot Richardson and Deputy Attorney General William Ruckelshaus after both men refused to fire Cox on the President’s behalf. Other Democrats who have made the exact same comparison, include Senate Intelligence Committee member Sen. Martin Heinrich, D-N.M., and Rep. Debbie Wasserman Schultz, D-Fla. The fake news media is also running wild with the conspiracy theory that Trump is offing those who are investigating him.